On 21 March 1955 received a call from Dr. G. F. Schilling of I.G.Y.-N.S.F. staff (1) Meeting of "Operation[Trig?]" Groups of T.P.R. for I.G.Y. 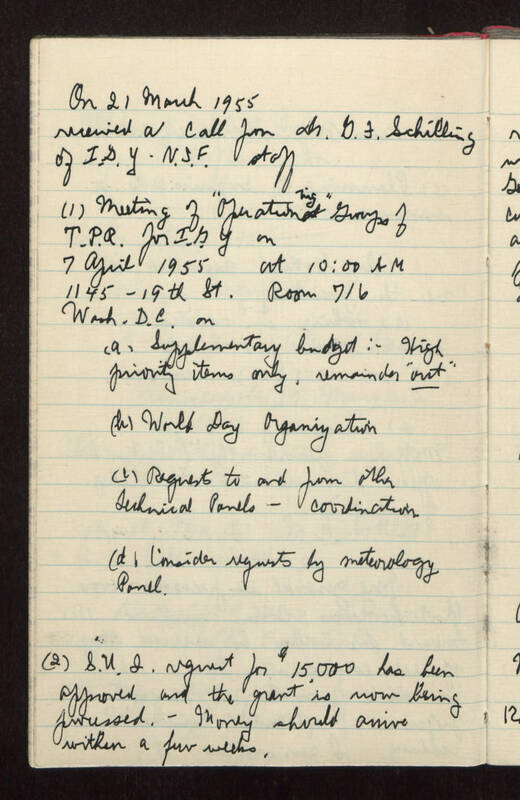 on 7 April 1955 at 10:00 AM 1145 - 19th Street Room 716 Washington D.C. on (a) Supplementary budget: High priority items only, remainder "out". (b) World Day Organization (c) Requests to and from other technical panels - coordination (d) Consider requests for meteorology Panel. (2) State University of Iowa request for $15,000 has been approved and the grant is now being processed. -- Money should arrive within a few weeks.